By My Standards (c) Hodges Photography/Lou Hodges Jr.
By My Standards didn't have many backers going in to Saturday's $1 million TwinSpires.com Louisiana Derby (G2), but trainer Bret Calhoun was undeterred about aggressively spotting his Goldencents colt, who had just broken his maiden in his fourth career start five weeks ago. "We actually thought we were very live in this spot," Calhoun said. 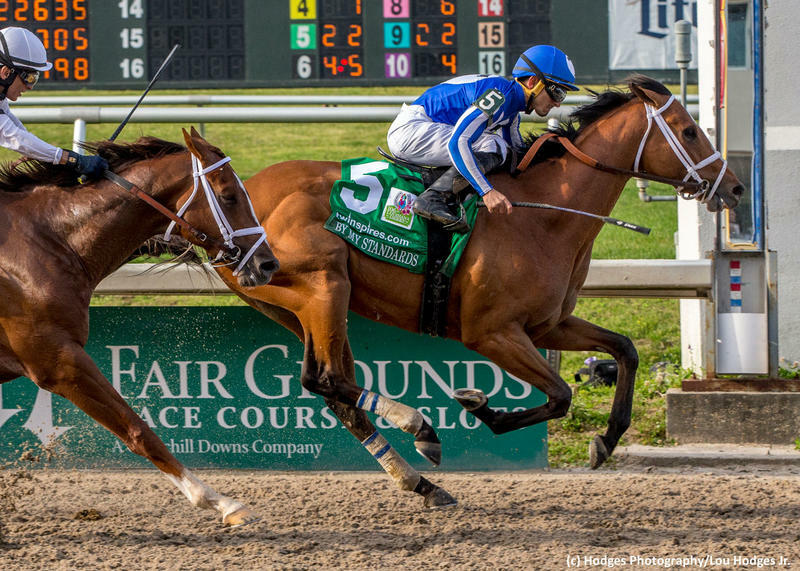 That was indeed the case as By My Standards continued a string of longshot winners throughout the afternoon at Fair Grounds with a 22-1 upset of the Road to the Kentucky Derby series event. Fourth into the first turn and down the backside as outsider Lemniscate set the pace, By My Standards waited for running room in upper stretch, found a seam in the two path inside Sueno, and caught the Todd Pletcher-trained Spinoff with an inside rally to take the Louisiana Derby by three-quarters of a length in a time of 1:49.53 for 1 1/8 miles on a fast track. Owned by Chester Thomas' Allied Racing Stable and ridden by Gabriel Saez, By My Standards paid $47. He cemented a spot in the Kentucky Derby (G1) field by earning 100 qualifying points. Spinoff, making his first stakes appearance of the season, earned 40 points and is also firmly in the Derby field. Sueno, five lengths adrift of runner-up Spinoff in third, earned 20 points to bring his total to 28 following earlier second-place finishes in the Sham (G3) and Southwest (G3). Risen Star (G2) runner-up Country House finished fourth and earned 10 points, boosting his total to 30 points. The disappointment of the race was 4-5 favorite War of Will, who had aced tests in the Lecomte (G3) and Risen Star. The colt's hind end appeared to give out briefly several strides out of the gate, thus he was farther back than usual early in mid-pack. He failed to produce a rally and finished ninth in the field of 11. This was the first start outside the maiden ranks for By My Standards, who had finished second or third in his first three outings before putting it all together in a maiden race on the Risen Star undercard February 16, winning by 4 1/4 lengths. His winning time for 1 1/16 miles was three-fifths of a second slower than War of Will's Risen Star. "The maiden came later than we expected," Calhoun said. "The light really came on after that race. The mornings he'd been phenomenal from that race moving forward and he really gave us a lot of confidence coming in here." Bred in Kentucky by Don Ladd and a $150,000 OBS two-year-old in training purchase, By My Standards is out of multiple stakes winner A Jealous Woman, by Muqtarib.